Not to sound too harsh but we find Lenny's to be devoid of character and not the type of place we want to spend our lunch time away from the office. But we had heard from more than one source that their sandwiches are tasty, and we'll ultimately never turn down a chance to discover good eats. Well, that and the weather was nasty outside and we didn't want too go far. 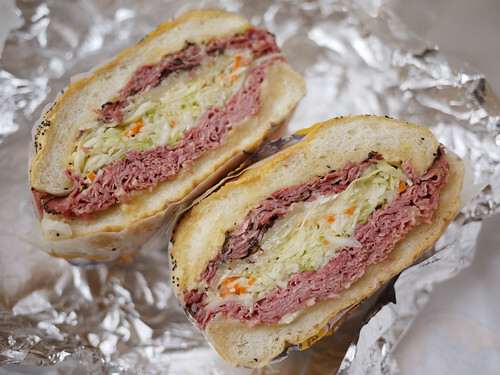 It took a long time to get my sandwich (the #1 Lenny's - hot pastrami & corned beef with swiss cheese, coleslaw and russian dressing, on a roll) despite it being before the lunch hour. It must have been all the people calling in their delivery order. It wasn't totally remarkable, but I have to give it credit for having good distribution of innards. That seemingly easy task is not easy to accomplish. It borders on overstuffed heavy but without becoming so, not too heavy and satisfying. I'd certainly be into trying more of their sandwiches.